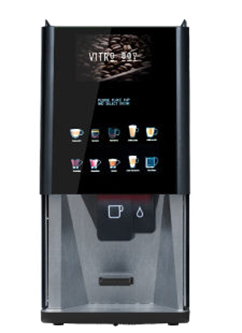 The Vitro S range offers high quality coffee shop style drinks at a the touch of a button. All the Vitro range have smoked glass door and touch screen user interface that displays a realistic and elegant menu, providing a state of the art look which will complement any location. 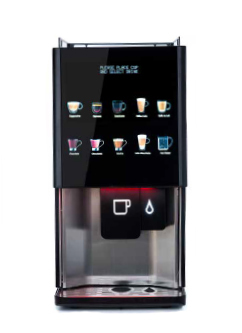 The user display, together with the cup positioning lighting system and intuitive tray position guides the user through a simple and pleasant experience when ordering a hot drink. Customisable mood lighting along the door can be easily changed to the desired colour to match any environment. The intelligent lighting system for the dispense area and beverage locator can be changed to suit the environment. The Vitro S3 instant is a quick and compact soluble machine which features two coffees, chocolate and milk as standard with the ability to substitute sugar or other soluble products. 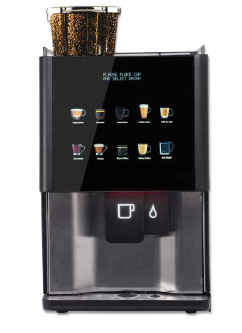 The Vitro S3 Fresh Brew Tea incorporates a paperless fresh leaf tea brewing system which takes freshly prepared leaf tea based drinks to the Vitro menu. 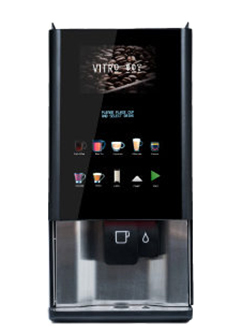 The Vitro S3 Bean to Cup offers a combination of freshly ground and brewed bean coffee with chocolate and milk. The Vitro S4 instant is ideal for those locations where capacity is critical, it has the same configuration as the Vitro S3 instant with an additional 30% volume. The machine has a large capacity boiler too for continuous supply and is prepared for Jug serving. 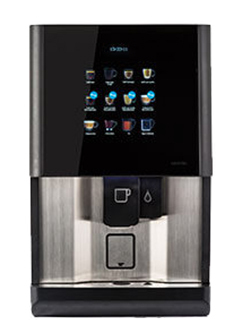 The Vitro S4 Fresh Brew Tea capacity is similar to the one found in free standing machines. This quick service machine is capable to produce a freshly brewed tea in 20 seconds. 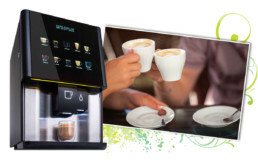 The Vitro S5 offers the authentic taste of the real espresso. 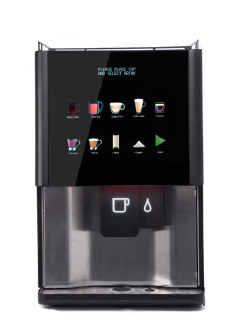 The Vitro S5 differentiates from the rest of the machines due to its 12 selection buttons and its integrated cup holder. This machine is recommended on unattended locations thanks to its high capacity and secured tray.